love this – sent to me by Jasmine Singer of Our Hen House – visit their website, a complete treat, they do amazing, amazing work! I……I do not understand the human race, that has so little love for creatures with a different face. Treating animals like people is no madness or disgrace. I do not understand the human race. Why do we treat animals like animals? How can people be so inhumane? Cows and chickens work to feed us. Dogs and horses show they need us. And though cats don’t always heed us, their affection is plain. What do we do? We neglect them! We do nothing to protect them! We reject them – don’t expect them to complain! We ignore them or we beat them! when we’re hungry, then we eat them! It’s appalling how we treat them! It’s insane! Like……animals! We humiliate and murder and confine them! We create their wretched status, then we use it to malign them! I mean, why should we say “treat him like a dog”? Why should we say “working like a horse”? Why should we say “eating like a hog”? When what we mean is “eating like a man”! Don’t we? Of course! “He’s as stubborn as a mule!” “He’s as stupid as an ox!” “He’s as slimy as a snake!” “He’s as crafty as a fox!” remarks like that really get my goat! Why can’t we say “noble as a frog”? Why don’t we say “healthy as a hen”? 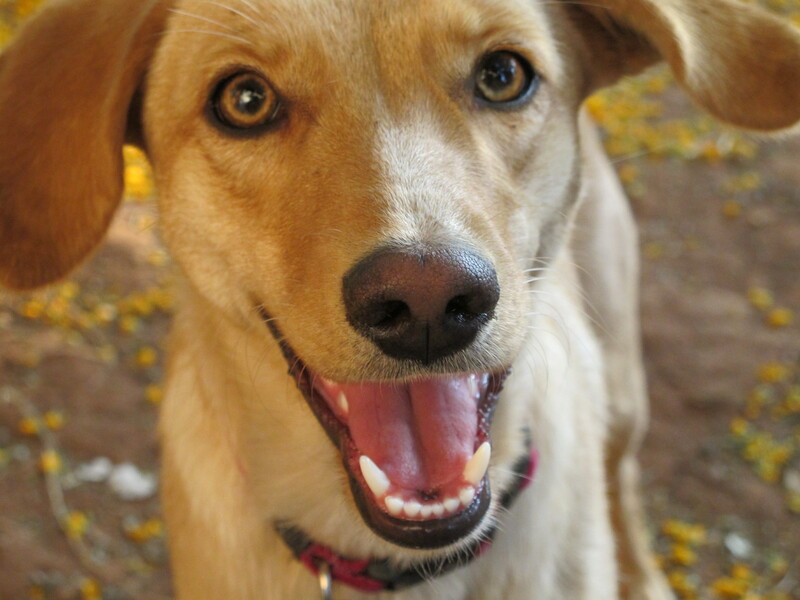 True we say “devoted as a dog” – but what we should say is “chic as a giraffe!” “Pretty as a pig!” eh? That’ll be the big day, won’t it? But when?……but when?……but when……? When will we stop treating them like animals? Is the human race entirely mad? Women see a baby goatskin – or a lambskin or a stoat skin – and to them it’s just a coat skin! Oh, it’s terribly sad! Like animals! Like animals! Like animals! It’s true we do not live in a zoo… but man is an animal, too! So why can’t you – like me – like animals! 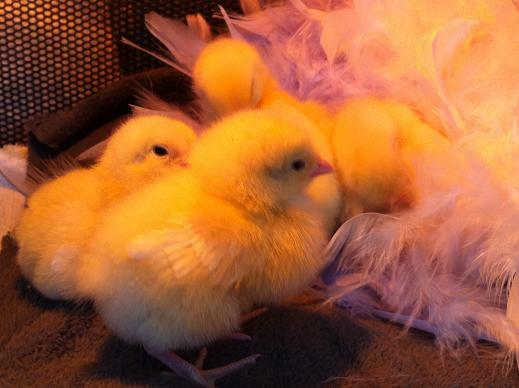 Baby chicks come into my life, and are an entirely new experience……. 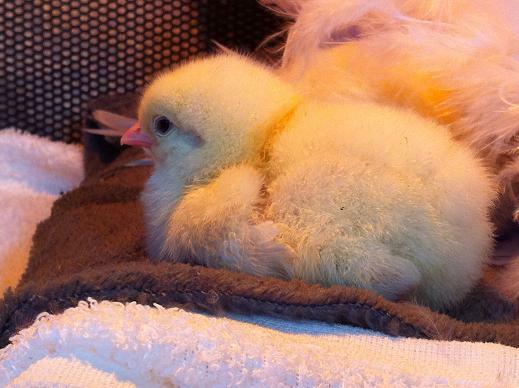 Last week my sister arrived at my home with 2 tiny baby chicks she had rescued that were destined for animal food. They were aprox 3 days old, and were cold, hungry and thirsty. They had had too much exposure to elements and not enough TLC. 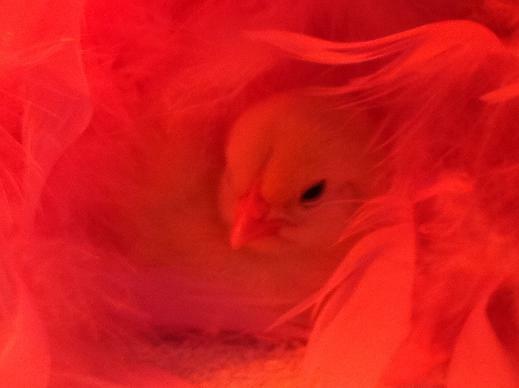 This is the plight of most baby roosters hatched in a hatchery. They are usually luckier if death is by maceration (a huge grinder) a few days after hatching, rather than being thrown into a box, and transported to their next end. Both Thomas and Muffin died within 48 hours of me getting them. In retropsect, I stood little chance of pulling them through, but tried anyway. My heart broke last Saturday, as I held baby Thomas and watched the life ebb out of him over a period of 2 hours. He peeped pitifully talking to me constantly, until the last half hour, when he was too weak to peep anymore. I was so sad for all the pain and suffering out there in the world, and so angry at an industry that treats animals as products and not as sentient beings. Baby ThomasDesperately trying to keep baby Tom warm, and connected. Heart broken, and feeling as though I had had this bundle of joy brought into my life, and as quickly taken away, I decided to look at the options for getting some more chicks. 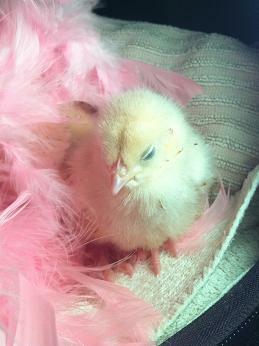 My experinece with chicks is limited, as we mostly rescue mature hens and roosters. 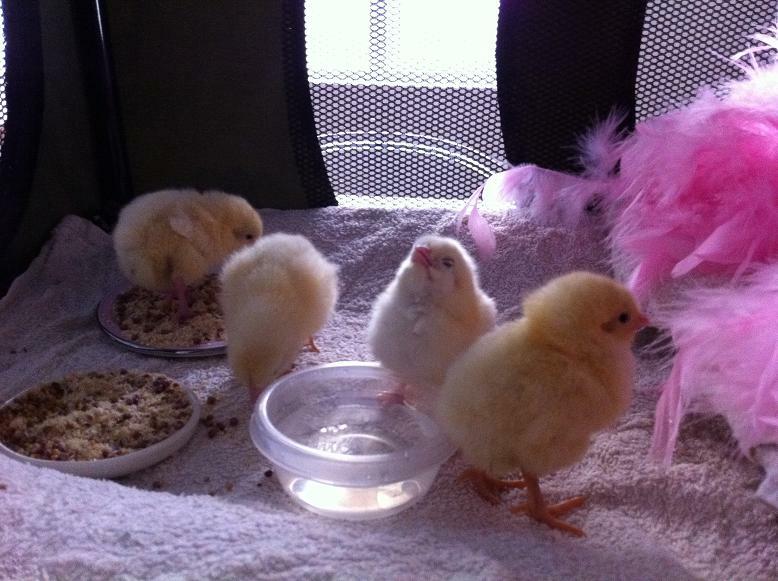 I decided that getting chicks that were destined for battery, was the way to go. I found a company that specifically hatches laying hens for battery houses, and asked them how I go about buying 2. They laughed, and said usually we sell hundreds at a time, but that I could buy 2 if I wanted – R 5.47 each! Tuesday morning saw our 3 respective staff members, my one daughter and myself prepare a basket with a hot water bottle, and some feathers, and set off to get out new babies. Security was tight at the facility, and we were not allowed anywhere near the hatchery. 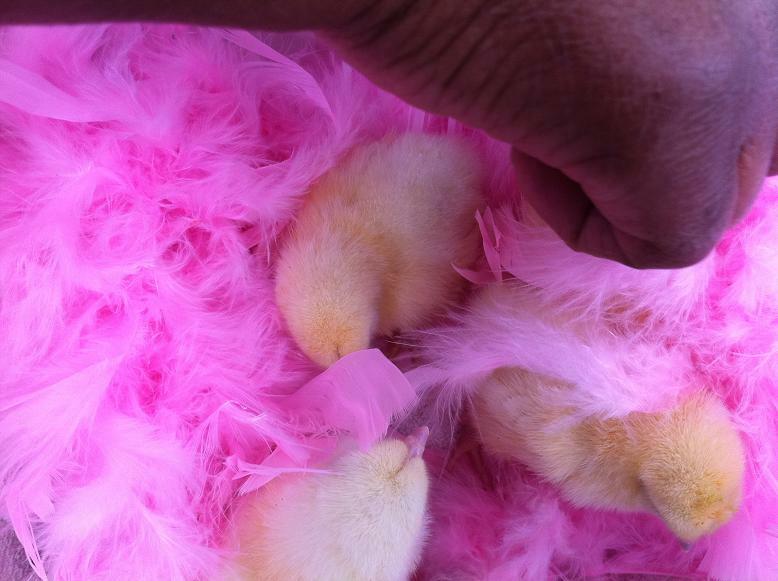 We handed over our basket and asked the guy there to choose 2 chicks for us. 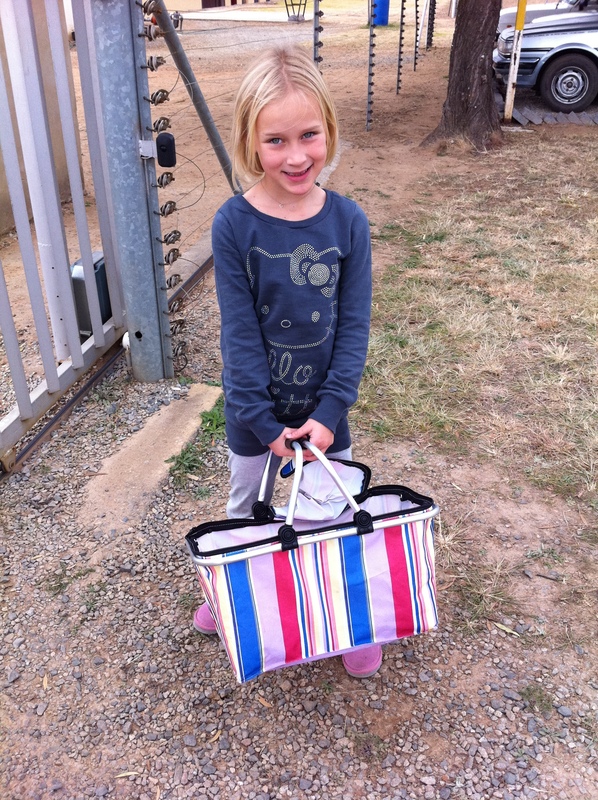 Our hot water bottled basket caused much hilarity – apparently chicks are usually packed in cardboard boxes or crates. We are now going into our 4th day with our new girls. I am starting to relax a little – they seem strong, and it seems we are doing all the right things. Keeping them in a consistantly warm environment is key. We are operating an infra red light during the day, plus a space where they can go to be on hot water bottles with feathers on top. During night, we turn off the infra red, as they do not seem to settle with it on, and keep them on hotties. I am feeding them a ground mix of chick food, almonds, sunflower seeds, bird seed, and some grit from the garden to help them digest food. It was suggested we microwave the grit first to eliminate any bacteria from our dogs or other chickens, until they get stronger and older. so…….adherring to those principles stringently, and it seems to be working. I have learned so much this week, just comparing the 2 little men last week to the 4 stronger, healthier girls this week. Their behavious is so different – the girls are live wires, playing, hopping, jumping, eating, drinking, foraging – one of them even starting an afternoon sandbath on the towel they are on. The boys last week, were so sick and weak, they did very little of that. The boys had very smelly poos, and they were coated in mucus. These girls poo tiny little mousse like knots, that hardly smell at all. I don’t think I could have done much more for those 2 little boys, but of course with every rescue, I have the opportunity of learning something more that assists in creating the best possible outcome for future rescues. 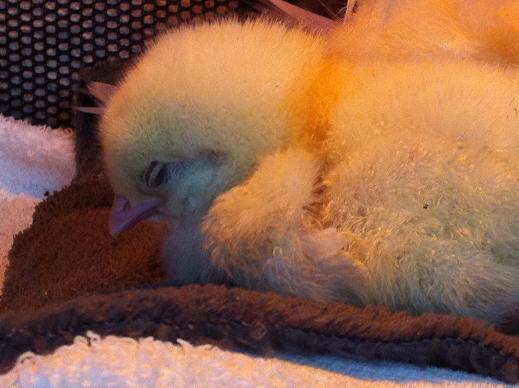 cat nap – or chick nap – warm and cosy…..
this is such a grown up hen position – I love it! 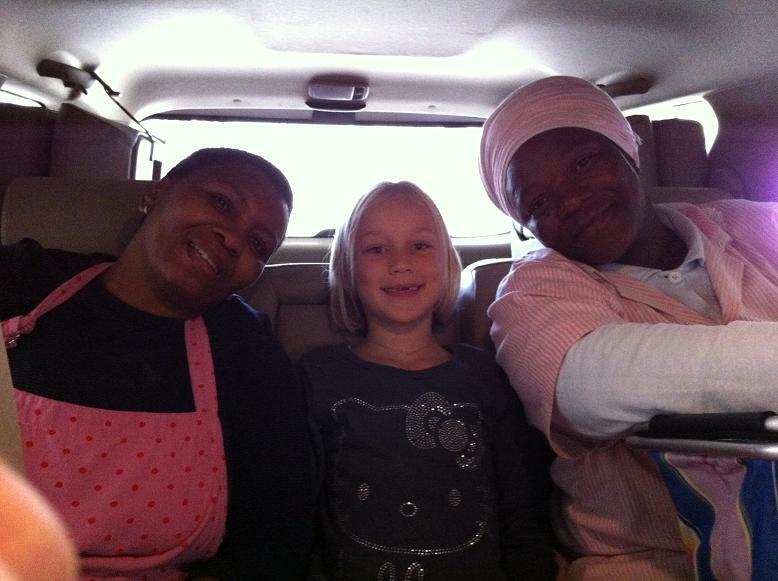 What a joy to have them here with us!